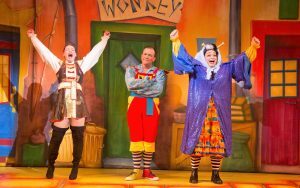 This year’s pantomime at the Yvonne Arnaud will certainly not disappoint the children or the grown-ups, with something for everyone. It has the perfect concoction of a dashing, thigh-slapping Aladdin, superbly played by Emma Thornett, a beautiful Princess Jasmine and a delightful and magical genie. The wicked wizard Abanazar, is a devilishly evil character, brought to life by Kit Hesketh-Harvey. Abanazar sneers sarcastically at the audience and his cackling laughter is enough to send shivers down the little ones sides, encouraging a cacophonie of ‘boos’. A packed out theatre, quiet with anticipation, were soon roused into an evening of revelry and hysterical laughter. Wishee Washee, played by Jamie Brook, and the grandest of dames Widow Twankey, played by Eagle Radio’s Peter Gordon, gave the audience a hilarious demonstration of their new washing machines at the Peking Laundrette, with unfortunate consequences for poor PC Pongo the policeman. The traditional Twelve Days of Christmas has been updated for a newer version, where “a bra that was meant to hold three” replaces the partridge in a pear tree, and every time we get to five, five custard pies are splattered all over poor Wishee Washee’s face. The stage becomes such a muddle of props and custard pies, it’s no wonder Wishee Washee slid right off the stage. This is pure unadulterated silliness, and the crowd loved it. As for the story, evil Abanazar tricks the young Aladdin into believing he can make him rich, convincing him to go deep inside a cave to find the magic lamp. However, all is not lost. With some help from the audience of course, Aladdin uses the ring to summon up the Genie, Janie Dee. Partial to a drop of fizz, the sparkling and charming Genie casts a magical spell over the audience and you will be entertained as if by magic. The costumes and choreography brought a smile to everyone’s face. With sequins aplenty and a carpet that really does fly across the stage and through the night, this production of Aladdin is everything that panto should be, with bonhomie, innuendo and singing in abundance. The young members of the cast deserve a special mention as they are truly brilliant and their singing and dancing bring a touch of the West End to the show.